The UK snooker championship tomorrow though 1 round will not be shown on TV , that starts from the last 64 starting Saturday. There is 3 players to me that have been the players of this season far and that is Mark Selby, John Higgins and Judd Trump. Of course there is a number of other players that could take home the title O'Sullivan, Robertson, Ding, Murphy, Bingham to name but a few . 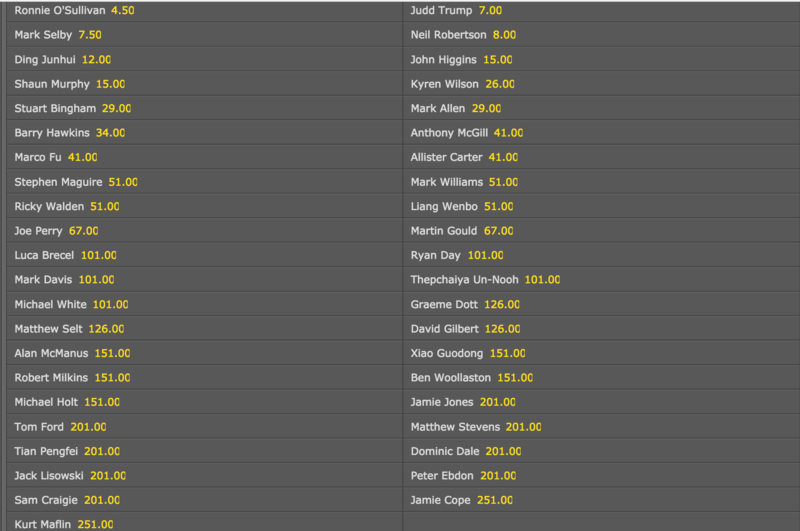 As Selby and Higgins are the same quarter I am going for Judd Trump. Trump won the European open beating O'Sullivan in a terrific final and almost followed it with back to back titles but ran out of steam in the British open final. I have seen an extra maturity with Trumps play this year and had him ear marked for this and he is obviously giving extra attention as he pulled out of Northern Ireland Open to give extra preparation for the UK. What helps too is that he has a kind draw. Marco Fu is the next highest rank player in his 16 man part of the draw and he has had a poor season so far. On paper Trump is due to meet Ding in the quarters if it follows the rankings which of course is not always the case. I be disappointed if Trump doesn't make the quarters at least but wouldn't surprise me if there is another Trump trying to hog the headlines come 4 December. Also have one first bet and that is Daniel Wells to beat Ian Burns. Wells has had a decent season winning 10 of his 18 match so far reaching the last 16 and 32 of a couple of tournaments beating some good players on his way namely Mark Allen and Kyren Wilson whilst Ian Burns has struggled winning just 5 of his 14 matches and hasn't gone any further than the last 64 of any of his 8 tournaments this year. @Mullahoran- I'm going to try and watch some of it over the weekend, as there's players I don't even know anymore! Good luck with your bets. Thanks Sir Puntalot, not a bad start Daniel Wells squeezes through 6-5 and a comfortable win for Judd Trump. Well didn't dream a young rookie Oliver Lines would take out the Trump but he fully deserved too. Haven't fancied anything since but I have to get involved in the final. O'Sullivan playing Selby a mouthwatering class , difference in styles and so many more . Have to side with the World no1 Mark Selby ,he got to the final with some great play plus his battling qualities especially in the last frame decider v John Higgins. O'Sullivan has had a dream run to the final playing people that were overawed and out of form. Mark Williams who lost to O'Sullivan last night described O'Sullivan play the worst he has seen of him for quite sometime. Ronnie has said that he is the underdog in the final and whilst you can take what he say sometimes with a pinch of salt he knows he's not playing his best and is going to have a tough final. Of course Ronnie could come out and suddenly hit top form but on the evidence of the last week and season the value is on the Jester beating Ronnie probably in a close match. Selby wins 10-7 in a top quality final especially tonight where was 5 centuries between the 2 players in 9 frames.